~~Today my Mom and I took the girls to the pumpkin patch. Fun, fun, crazy fun. 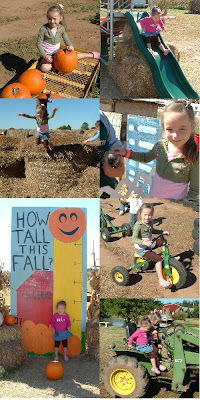 There was a hay maze, corn maze, petting zoo, tricycle races, hay slides, hay ride and more. It was a lot of fun though and the weather was beautiful. I think the girls had a great time. ~~Thanks for all the birthday wishes yesterday. I had a wonderful day.